The word camphor derives from the French word camphre, itself from Medieval Latin camfora, from Arabic kāfūr, from Tamil karpūram (கற்பூரம்), from Austroasiatic languages – Khmer kāpōr / kapū, Mon khapuiw, ultimately from an Austronesian source – Malay kapur. Camphor was used in India from ancient time when religions like Buddhism and Jainism flourished. However, Suśruta and later kāvya literature mention this word. In Old Malay it is known as kapur Barus, which means “the chalk of Barus”. Barus was the name of an ancient port located near modern Sibolga city on the western coast of Sumatra island. This port traded in camphor extracted from laurel trees (Cinnamonum camphora) that were abundant in the region. Even now, the local tribespeople and Indonesians in general refer to aromatic naphthalene balls and moth balls as kapur Barus. The background of Gustaf Komppa‘s synthesis was as follows. In the 19th century, it was known that nitric acid oxidizes camphor into camphoric acid. Haller and Blanc published a semisynthesis of camphor from camphoric acid. Although they demonstrated its structure, they were unable to prove it. The first complete total synthesis of camphoric acid was published by Komppa in 1903. Its inputs were diethyl oxalate and 3,3-dimethylpentanoic acid, which reacted by Claisen condensation to yield diketocamphoric acid. 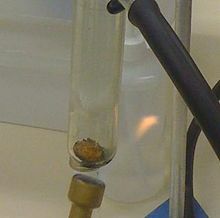 Methylation with methyl iodide and a complicated reduction procedure produced camphoric acid. William Perkin published another synthesis a short time later. Previously, some organic compounds (such as urea) had been synthesized in the laboratory as a proof of concept, but camphor was a scarce natural product with a worldwide demand. Komppa realized this. He began industrial production of camphor in Tainionkoski, Finland, in 1907 (with plenty of competition, as Kennedy Duncan reported). The first significant manmade plastics were low-nitrogen (or “soluble”) nitrocellulose (pyroxylin) plastics. In the early decades of the plastics industry, camphor was used in immense quantities:130 as the plasticizer that creates celluloid from nitrocellulose, in nitrocellulose lacquers and other plastics and lacquers. In the ancient Arab world, Camphor was one of the most popular perfume ingredients. According to the Perfume Handbook, “[Camphor] features in more than a quarter of al-Kindi’s perfume recipes and in many other medieval Arabic works, including the Arabian Nights Tales.“ The word camphor or campheer also appears in many translations of the biblical Song of Solomon. However, the original Hebrew word kopher, actually refers to henna, another perfume and dyestuff of the Arabic world. In ancient and medieval Europe, camphor was used as an ingredient in sweets. It was used in a wide variety of both savory and sweet dishes in medieval Arabic language cookbooks, such as al-Kitab al-Ṭabikh compiled by ibn Sayyâr al-Warrâq in the 10th century, and an anonymous Andalusian cookbook of the 13th century. It also appears in sweet and savory dishes in the Ni’matnama, a book written in the late 15th century for the sultans of Mandu. An early international trade in it made camphor widely known throughout Arabia in pre-Islamic times, as it is mentioned in the Quran 76:5 as a flavoring for drinks. By the 13th century, it was used in recipes everywhere in the Muslim world, ranging from main dishes such as tharid and stew to desserts. An alcohol analog of camphor also known as isoborneol currently is used in Asia as a flavoring, mostly for sweets. In India it is widely used in cooking, mainly for dessert dishes, and is known as kachha karpooram or “pachha karpoora” (“crude/raw camphor”), in (Telugu:పచ్చ కర్పూరo), (Tamil:பச்சைக் கற்பூரம்), (Kannada:ಪಚ್ಚ ಕರ್ಪೂರ), and is available in Indian grocery stores where it is labeled as “edible camphor”. The global effects on the body include tachycardia (increased heart rate), vasodilation in skin (flushing), slower breathing, reduced appetite, and increased secretions and excretions such as perspiration and urination. Based on Hahnemann‘s writings, camphor (dissolved in alcohol) was used in the 19th century to treat the 1854-1855 cholera epidemics in Naples. In 1980, the US Food and Drug Administration set a limit of 11% allowable camphor in consumer products, and banned products labeled as camphorated oil, camphor oil, camphor liniment, and camphorated liniment (except “white camphor essential oil“, which contains no significant amount of camphor). Since alternative treatments exist, medicinal use of camphor is discouraged by the FDA, except for skin-related uses, such as medicated powders, which contain only small amounts of camphor. Camphor is widely used in Hindu religious ceremonies. It is put on a stand called ‘karpur dāni’ in India. Aarti is performed after setting fire to it usually as the last step of puja. ^ a b c d NIOSH Pocket Guide to Chemical Hazards. “#0096”. National Institute for Occupational Safety and Health (NIOSH). ^ a b c “Camphor (synthetic)”. National Institute for Occupational Safety and Health (NIOSH). 4 December 2014. Retrieved 19 February 2015. ^ “Rosemary”. Drugs.com. Retrieved 23 July 2016. ^ Drakard, Jane (1989). “An Indian Ocean Port: Sources for the Earlier History of Barus”. Archipel. 37: 53–82. doi:10.3406/arch.1989.2562. ^ “Camphor”. britannica.com. Retrieved December 12, 2018. ^ a b c d Kennedy Duncan, Robert (1911), “Camphor: An Industry Revolutionized”, Some Chemical Problems of Today, Harper and Brothers, LCCN 11026192. ^ Dutton, William S. (1942), Du Pont: One Hundred and Forty Years, Charles Scribner’s Sons, LCCN 42011897. ^ Chakrabarti K, Chakrabarti R, Chattopadhyay KK, Chaudhuri S, Pal AK (1998). “Nano-diamond films produced from CVD of camphor”. Diam Relat Mater. 7 (6): 845–52. Bibcode:1998DRM…..7..845C. doi:10.1016/S0925-9635(97)00312-9. ^ Kumar M, Ando Y (2007). “Carbon Nanotubes from Camphor: An Environment-Friendly Nanotechnology”. J Phys Conf Ser. 61 (1): 643–6. Bibcode:2007JPhCS..61..643K. doi:10.1088/1742-6596/61/1/129. ^ The Housekeeper’s Almanac, or, the Young Wife’s Oracle! for 1840!. No. 134. New-York: Elton, 1840. Print. ^ Fu JT, Tang L, Li WS, Wang K, Cheng DM, Zhang ZX (2015). “Carbon Nanotubes from Camphor: An Environment-Friendly Nanotechnology”. J Insect Sci. 15 (1): 129. doi:10.1093/jisesa/iev112. PMC 4664941. PMID 26392574. ^ “Mummy-making complexity revealed”. Retrieved 3 July 2018. ^ Inc., Shopsmith. “Tips For Cabinet Making Shops”. www.cabinetshoptips.com. Retrieved 3 July 2018. ^ Donkin, R.A. (1999). Dragon’s Brain Perfume: An Historical Geography of Camphor. Brill. ISBN 978-9-004-10983-4. ^ Nasrallah, Nawal (2007). Annals of the Caliphs’ Kitchens: Ibn Sayyâr al-Warrâq’s Tenth-century Baghdadi Cookbook. Islamic History and Civilization, 70. Leiden, The Netherlands: Brill. ISBN 978-0-415-35059-4. ^ a b “Andalusian Cookbook: Table of Contents”. www.daviddfriedman.com. Retrieved 3 July 2018. ^ Titley, Norah M. (2004). The Ni’matnama Manuscript of the Sultans of Mandu: The Sultan’s Book of Delights. Routledge Studies in South Asia. London, UK: Routledge. ISBN 978-0-415-35059-4. ^ Green, B. G. (1990). “Sensory characteristics of camphor”. The Journal of Investigative Dermatology. 94 (5): 662–6. doi:10.1111/1523-1747.ep12876242. PMID 2324522. ^ Kotaka, T.; Kimura, S.; Kashiwayanagi, M.; Iwamoto, J. (2014). “Camphor induces cold and warm sensations with increases in skin and muscle blood flow in human”. Biological and Pharmaceutical Bulletin. 37 (12): 1913–8. doi:10.1248/bpb.b14-00442. PMID 25451841. ^ Bonica’s Management of Pain (4th ed.). Philadelphia, Baltimore: Wolters Kluwer – Lippincott Williams & Wilkins. 2009. p. 29. ISBN 9780781768276. ^ Moqrich, A.; Hwang, S. W.; Earley, T. J.; Petrus, M. J.; Murray, A. N.; Spencer, K. S. R.; Andahazy, M.; Story, G. M.; Patapoutian, A. (2005). “Impaired Thermosensation in Mice Lacking TRPV3, a Heat and Camphor Sensor in the Skin”. Science. 307 (5714): 1468–72. Bibcode:2005Sci…307.1468M. doi:10.1126/science.1108609. PMID 15746429. ^ Xu, H.; Blair, N. T.; Clampham, D. E. (2005). “Camphor activates and strongly desensitizes the transient receptor potential vanilloid subtype 1 channel in a vanilloid-independent mechanism”. The Journal of Neuroscience. 25 (39): 8924–37. doi:10.1523/JNEUROSCI.2574-05.2005. PMID 16192383. ^ Selescu, T.; Ciobanu, A. C.; Dobre, C.; Babes, A. (2013). “Camphor activates and sensitizes transient receptor potential melastatin 8 (TRPM8) to cooling and icilin”. Chemical Senses. 38 (7): 563–75. doi:10.1093/chemse/bjt027. PMID 23828908. ^ “Camphor overdose”. Medline. NIH. Retrieved January 19, 2012. ^ Martin D, Valdez J, Boren J, Mayersohn M (Oct 2004). “Dermal absorption of camphor, menthol, and methyl salicylate in humans”. Journal of Clinical Pharmacology. 44 (10): 1151–7. Bibcode:1991JClP…31..928S. doi:10.1177/0091270004268409. PMID 15342616. ^ Uc A, Bishop WP, Sanders KD (Jun 2000). “Camphor hepatotoxicity”. Southern Medical Journal. 93 (6): 596–8. doi:10.1097/00007611-200006000-00011. PMID 10881777. ^ “Poisons Information Monograph: Camphor”. International Programme on Chemical Safety. ^ Pearce, J.M.S. (2007). “Leopold Auenbrugger: Camphor-Induced Epilepsy – Remedy for Manic Psychosis”. European Neurology. 59 (1–2): 105–7. doi:10.1159/000109581. PMID 17934285. ^ Bayes (1866). “Cholera, as Treated by Dr. Rubini”. The American Homoeopathic Review. 6 (11–12): 401–3. ^ a b “Camphor Inhalation Liquid: Indications, Side Effects, Warnings – Drugs.com”. Retrieved 3 July 2018.